It had been a lovely experience, sure. I'd played it to around the halfway mark, taken a short break, then finished it. It seemed very nice. Remarkably pretty, and with a gorgeous soundtrack. Past that, I couldn't quite nail it down. 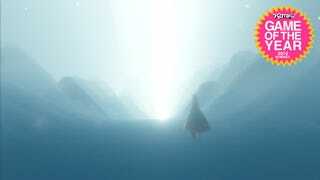 The second time I played Journey, I thought, "That was one of the most beautiful video games I've ever played." I guess I just needed some perspective. Journey is the rare game that exists as a coherent whole, a fully-realized work in which each fifteen-minute chunk of its two-hour runtime is equally important. Because of that, it's a rare game that needs to be taken and digested as a single entity. Many good games can be stripped for parts, analyzed afterwards as a series of excellent, good, and bad levels. The train sequence in Uncharted 2; the Chernobyl level in Modern Warfare; the final chase in Assassin's Creed III. Most video games are collections of discrete ideas that have been unified, with varying degrees of success, by an overarching narrative. Not Journey. Sure, the game has separate sections: Anyone who's played it will remember the underground seaweed-platforming, the sandstorm towers, the great carpet-whale, and the terrifying mechanical hunters. And they'll remember surfing the sand alongside red dolphins, the radiant sun melting into the desert in the distance. But those moments pass into one another so quickly and seamlessly that the game demands to be taken as a whole. And so it wasn't until I drew near the close of my second journey (which, I'll note, I did in one rapt sitting) that I really "saw" the game. Climbing the snowy mountain, pushing forward against the wind and the ice, I realized that my scarf was gone. I hadn't noticed its departure; somewhere along the way, it had simply dissolved. I could no longer jump, let alone fly. All that was left was a brutal push forward toward a cold, lonely death. I thought back to that sunset, when I'd been so free and full of life; when my scarf had been so long, and my whole journey before me. I'm 32 now, and while some part of me still thinks I'll be young forever, I'm more aware of my mortality than ever. My back hurts. I cough, even when I'm not sick. I see pictures of myself and notice wrinkles around my eyes. I don't get as hungry as I used to. And I know how it happens, I can picture it: The moment when I'll finally realize I've well and truly become older, weaker, slower. The moment when I'll realize that my scarf is gone, and I didn't even see it leave. So… um, Journey. The story of a scarf. Game of the year, right? It's not just metaphorical mumbo-jumbo that makes Journey special. It's an immaculately constructed game, as well. Its visual wonders are unmatched by any game released this year. Its beauty is almost matter-of-fact at times; the billowing sands, the calls of the flying carpets, the fade-to-white as you come face to face with your elders. The way it moves, even the jumping connects on an emotional level. And the music…. sigh, the music. I really don't know what else to say about it. How else can I dance about this particular architecture? Composer Austin Wintory's work is essential. Like the game it accompanies, its themes unite into a single vision that is greater than the sum of its already-great parts. The third time I played Journey, I thought I understood it. It was a couple of weeks ago, and I decided to give the game another run in order to confirm that yes, I wanted to write this very article defending it as a nominee for Kotaku's Game of the Year award. It had been several months since I last played, and during that time I'd played a bunch of other great games. Would Journey hold up? Turns out it didn't just hold up; it surprised me all over again. More accurately, it allowed some other people to surprise me. Now that the game has been in the wild for months, there are scores of people still playing it, benevolent strangers swooping in and out of one another's games like so many controller-holding sand-dolphins. Midway into my third journey, a so-called "white robe" joined my game. This player, who had collected every glyph in the game and therefore had the longest, most amazing scarf I'd ever seen, was determined to help me get my own white cloak. Shortly after we met, I came upon a glyph I just couldn't reach. It was on a high shelf, and my scarf wasn't long enough to get me to it. And so my white-robed companion and I set about getting me to the glyph. We didn't explicitly decide to undertake this endeavor—after all, you can't talk to one other in Journey, you can only issue one-note "calls." But still, we knew exactly what we were doing. Time and again we tried, and time and again we failed. It got to the point where I felt uncomfortable, like, "Okay, this person probably has to go, I should just give up, this is getting weird." And yet we kept trying. And then, finally, we coordinated our jumps just so, and I reached the shelf and collected the glyph. I came soaring down from on high, jubilantly pressing the "call" button over and over. Rings of light radiated from my character's body as I landed next to my nameless helper, and at once he (or she) began to call back. For a minute we both just stood there, triumphant, calling out to one another. I have no idea who this person was; maybe it was a man, maybe a woman; maybe a child, or a grandparent. Together, we moved onward toward the mountain, until all at once, I was alone again. Just like that. Journey could have just as easily been called Journeys. It's a plurality of experiences wrapped into a single shell. The journey in the title is more than just the one we take the first time we set off across the sands, and more than the fifth. The title represents hundreds, thousands of journeys; men and women around the world pushing forward together, striving, climbing, falling, and getting back up. Beautiful and sad, immaculately constructed and quietly assured, Journey is so confident in its ambitions that it almost seems ordinary. It is anything but ordinary. Journey should be our Game of the Year.